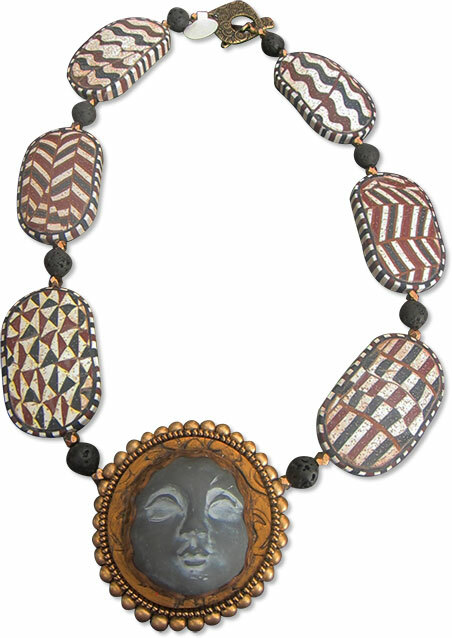 Lori Wilkes’ was one of six polymer booths at the local show and I spotted this new necklace. The beads looked African to me but she swears that she was following an Italian influence. Either way, kewl. She revealed that tool used to distress these beads is a fine wire dog brush. Lori has a book coming out in October that may satisfy readers who complain about how artists getting started in polymer can be deluged with confusing and conflicting information. Lori’s book, The Absolute Beginners Guide: Working With Polymer Clay, is from Kalmbach Books and it’s available for pre-order on Amazon. Sample a few pages here. Spotting polymer at artfairs is one of my favorite games. The others I found yesterday were Kim Arden, Valerie Wright, Annabelle Fisher, Greg and BJ Jordan, and River Wolfe. Hope I didn’t miss any. I was thrilled to get this in today’s newsletter. I have lots of dog grooming stuff from many years of working with and showiing dogs. Several of the tools I bought of course it turned out I didn’t really like. Now instead of them doing nothing buyt gather dust in the dogg grooming box, I’ll just move them over to the PC cabinets! BTW just to be on the safe side, once used for raw PC, I would not use them on the dogs but now they will have a purpose instead of going to waste. Thanks!